Of all the podcasts about all the towns in all the world, you have sadly stumbled upon this one. It’s time for another lackluster installment of the Vital Vegas Podcast! In this episode, we tackle all the Las Vegas scoop you need to keep you in the know, including the latest about Wynn Paradise Park. Casino tycoon Steve Wynn recently revealed new details about his waterpark, and we’ve got all the glorious WTF. The Wynn Golf Club closes Dec. 22, 2017 and construction of Wynn Paradise Park begins Jan. 3, 2018. Wynn Paradise Park will have a carnival theme, and will feature a white sand lagoon, a 47-story hotel tower, bumper cars, fireworks, a carousel, float parade and ziplines. 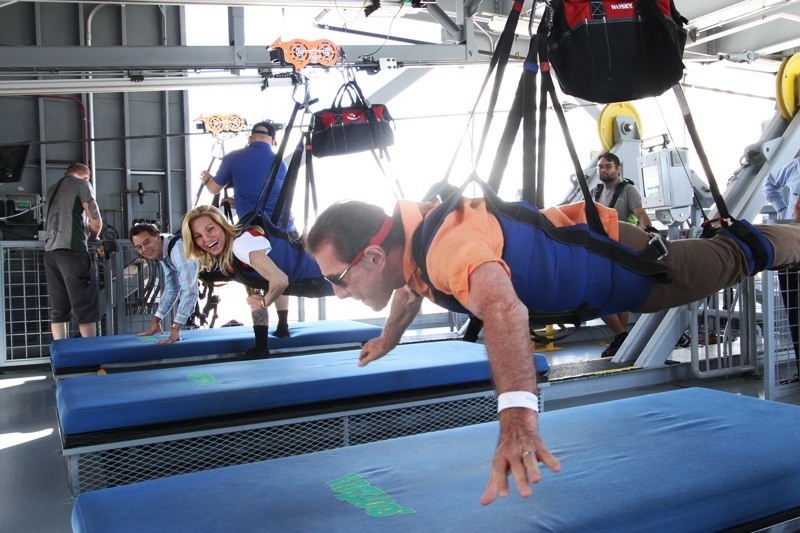 Steve Wynn is so serious about having ziplines at his Wynn Paradise Park, he rode one downtown. No, really. Also in this episode, we get granular about the transition of Monte Carlo to Park MGM. The “Listicle of the Week” includes 10 venues that have closed at Monte Carlo, as well as our incoherent memories of each. For example, we hung out with Wang Chung for hours at The Pub. And, yes, everybody had fun. 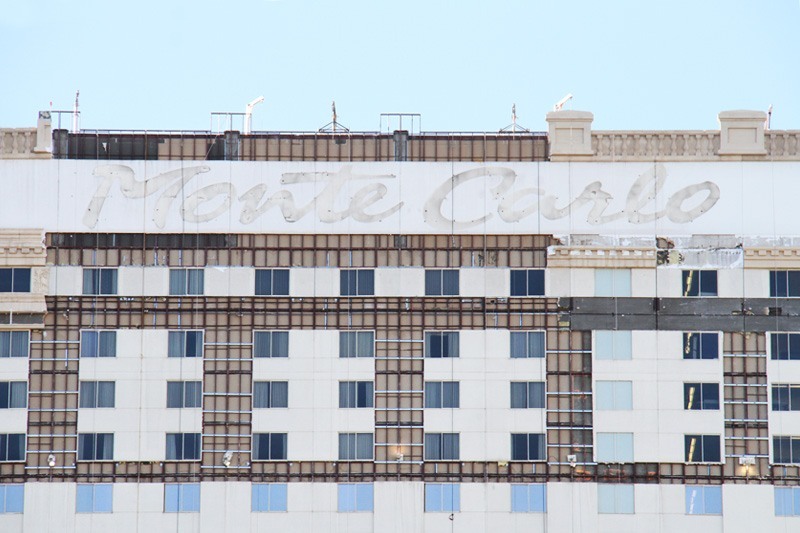 Here’s a look at the facade of Monte Carlo. There’s still time to say goodbye, but not much. We’ve got a metric hell-ton of perfunctory Las Vegas news, of course. Lowlights include Caesars Entertainment charging Nevada residents for self-parking, Charles Barnard (designer of the Stratosphere and Vegas Vickie) has died, David Copperfield and Tao Asian Bistro are raking in the bucks, Emeril Lagasse’s Table 10 closes at the end of 2017 and other juicy tidbits. Get your ears in gear and get your Vegas fix with the Vital Vegas Podcast! This entry was posted in Las Vegas, Vital Vegas Podcast on October 29, 2017 by Scott Roeben. In a move surprising virtually no one, Caesars Entertainment says it will begin to charge Nevada residents for self-parking on Nov. 2, 2017. The company will charge locals for self-parking at seven of its Las Vegas resorts. All those years spent learning Photoshop are finally paying off. 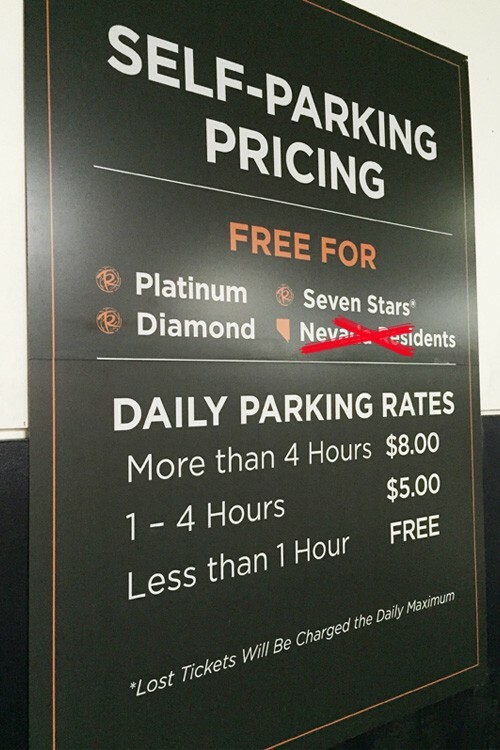 Nevada residents have gotten a free pass since Caesars rolled out paid parking to non-residents in April 2017. 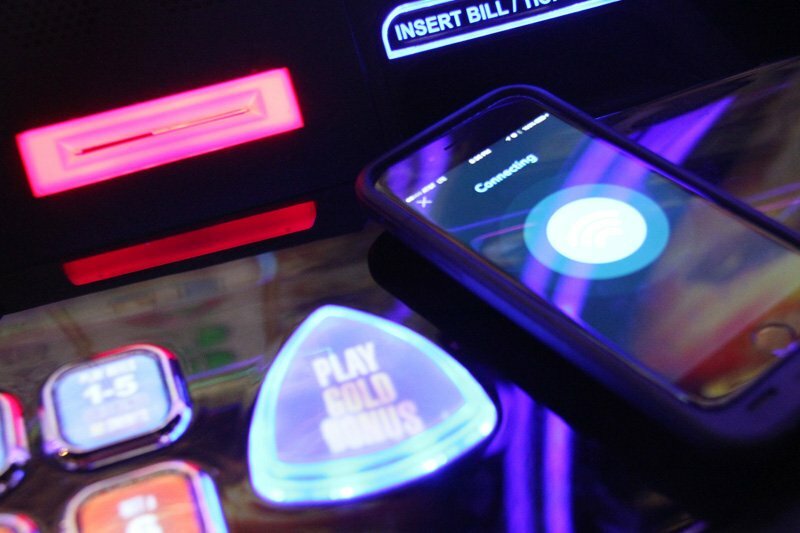 The resorts where locals will now experience the adrenaline rush of paying to self-park include: Bally’s, Caesars Palace, Cromwell, Flamingo, Harrah’s, Linq and Paris. Self-parking will continue to be free at Rio and Planet Hollywood, mainly because nobody’s all that thrilled to visit the Rio and parking at Planet Hollywood is operated by Miracle Mile Shops, not Caesars. Guests who park at the seven Caesars Entertainment resorts listed above for fewer than 60 minutes will continue to park free. Nothing says “Stay, relax and gamble awhile!” like giving people a one-hour deadline before they want to bolt. We love paid parking announcements because it’s another excuse to share this photo and provide this link. While there was a hue and cry when paid parking was first announced by MGM Resorts back in January 2016, at this point, there’s likely to be some hue but not much cry because locals make up only a small portion of guests at the major Strip casinos. Paid parking has been a windfall for Las Vegas casinos seeking to bolster their bottom lines. None of the casinos with paid parking is anxious to say exactly how much they make from the new policies, but we estimate these “found” profits run in the bajillions. There’s a way to get around paid parking at Caesars Entertainment resorts, but it has a caveat. Customers who get the company’s Total Rewards Visa Card are upgraded to Platinum tier status and receive free self and valet parking. The caveat: Cardholders must spend $5,000 or more on the card in each calendar year to maintain their Platinum status. Free parking is also available to those who get the M Life Rewards Mastercard from MGM Resorts. We did. It’s free and we quite enjoy not paying for parking when that money could be better spent on cocktails, thank you. The M Life Mastercard has no spending minimum. 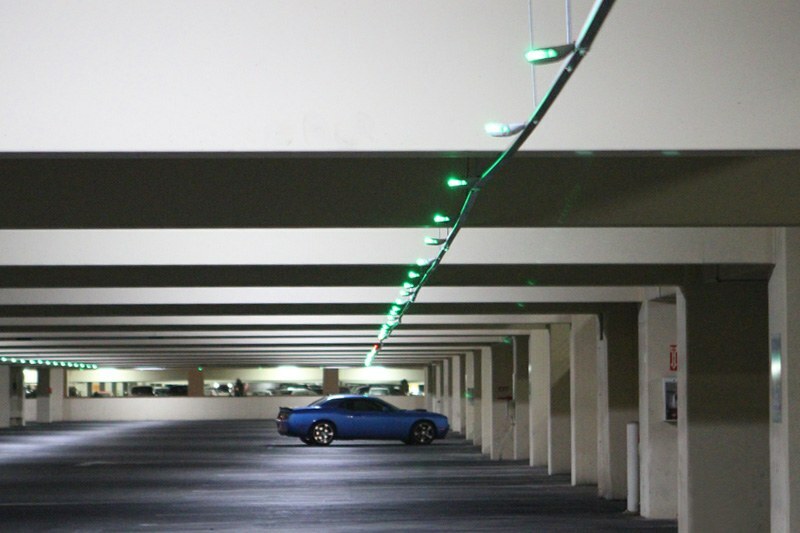 One of the enhancements presumably paid for by parking fees are these space indicator lights. We’ve tried to hate them, but they’re pretty handy in a crowded parking structure. 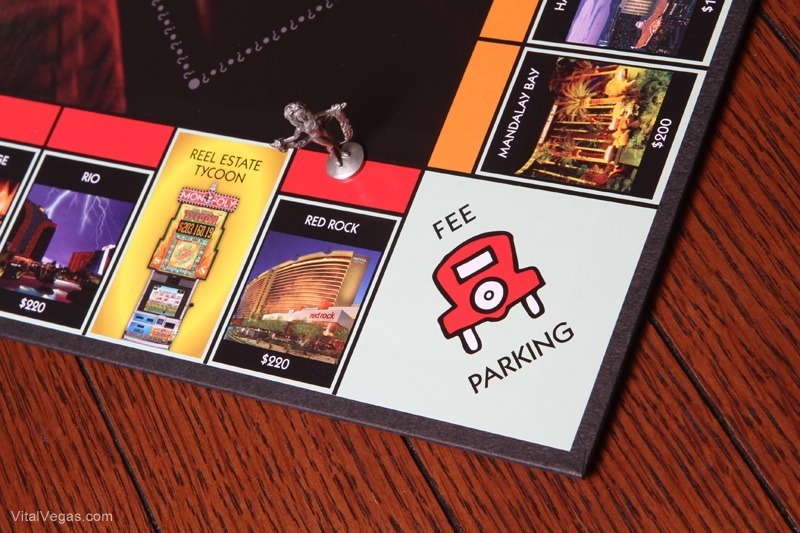 While we understand the business reasons behind instituting paid parking, it doesn’t make the fees any less irksome when we visit our favorite Las Vegas casinos. There is some consolation, although not much, in knowing parking at Las Vegas resorts tends to be much less expensive than parking in other comparable cities. Yes, there are still Las Vegas casinos on The Strip where parking is free, although the list is dwindling. Several Strip-ish casinos have free parking: Westgate, Hooters, Hard Rock, Tuscany, Silver Sevens, Ellis Island and others. Parking at Palace Station, Gold Coast, Rio, Palms, Orleans, South Point and M Resort remains free. Get all the details about paid parking on the Caesars Entertainment Web site. This entry was posted in Las Vegas on October 28, 2017 by Scott Roeben. For months, Caesars Entertainment officials have said the company will develop seven acres in front of Caesars Palace, now we’ve got the scoop on what that development will be. According to our source, the space in front of Caesars Palace won’t be what may have suspected, retail. The upcoming project is a much bigger move. We’re hearing Caesars Palace is set to build a new hotel tower. The new hotel tower is currently waiting for board approval, but we anticipate that approval, and an official announcement of the project, will come soon. Caesars Palace currently has 3,976 rooms. Yes, we counted. 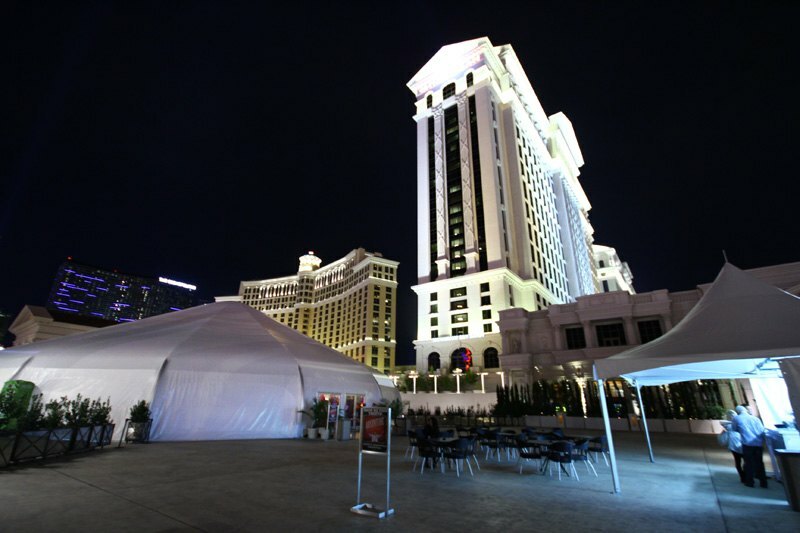 It seems the new Caesars Palace hotel tower will sit in the space where the “Absinthe” tent is located, but it’s unknown what that means for the popular show. This is the area where the new tower will go. 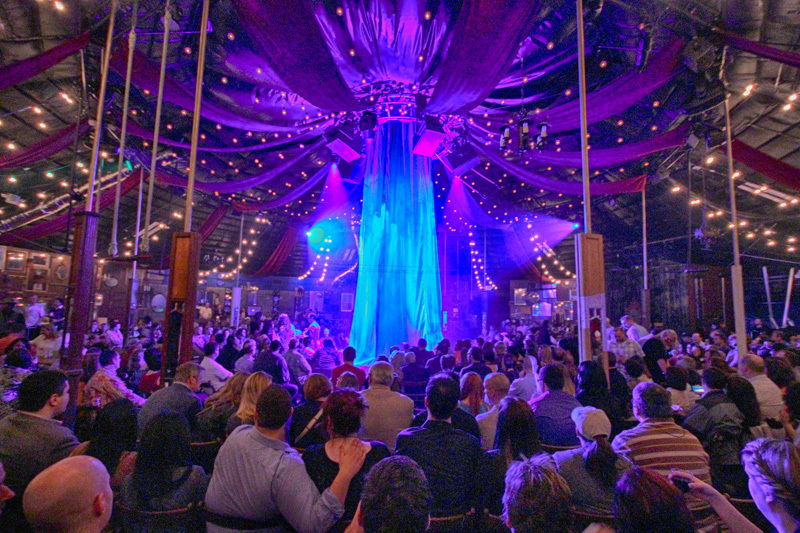 The “Absinthe” tent is much fancier now. 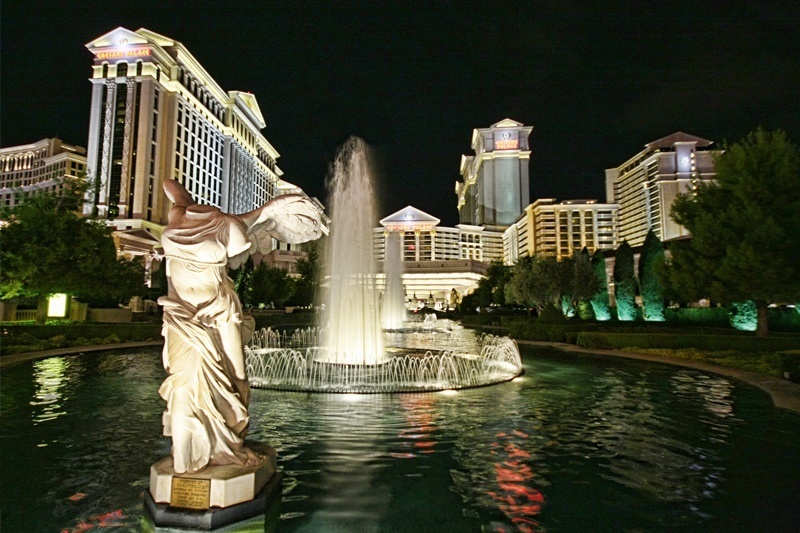 While the success of “Absinthe” has generated substantial revenue for Caesars, it would pale in comparison to the potential profit which would come from increased room inventory and convention space. There’s no timeline for when the new tower is being built, but it’s a good idea to see “Absinthe” while you still can. The new Gordon Ramsay’s Hell’s Kitchen restaurant, formerly Serendipity 3, will sit at the foot of the new tower. Hell’s Kitchen is expected to open in December 2017. Caesars Entertainment has played its development plans close to the vest, saying the land is ideal for “additional convention space to retail.” A new hotel tower could feature both. While the cost of the hotel tower project isn’t known, the resort’s 26-story, 949-room Augustus tower cost $289 million. Caesars Entertainment is flush with cash at the moment, about $2 billion, having recently emerged from bankruptcy, because ‘Merica. The arrival of another hotel tower in front of Caesars Palace would change the profile of the resort dramatically. 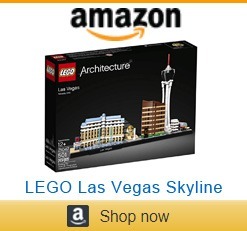 And we thought it was a big deal that a retail store was constructed on the casino’s fountains. Not all changes in Las Vegas are happy changes, but many are. Ultimately, Caesars Entertainment is looking to bolster its bottom line by making the most of under-utilized space. We love shiny new things in Las Vegas, so we’re already on board and can’t wait to see what’s in store for this iconic Las Vegas resort. 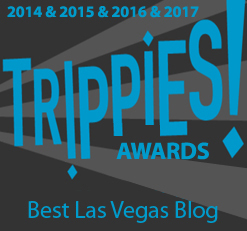 This entry was posted in Las Vegas, Las Vegas Casinos, Las Vegas Hotels on October 26, 2017 by Scott Roeben. Yes, it’s got a weird name. In addition, Dough Dough’s Hawaiian Cafe & Malasadas is in a weird location. The new restaurant is attached to the Gambler’s General Store in downtown Las Vegas. At first glance, you might think, “That’s a thing?” You think wrong. “Weird location,” however, isn’t a deterrent when a restaurant serves one of the best desserts we’ve ever had in Las Vegas. And trust us when we say we’ve had a lot of desserts in Las Vegas. Prepare yourself for the Dough Dough’s malasada. That sound you hear it Heaven opening its gates as a choir of angels sings. 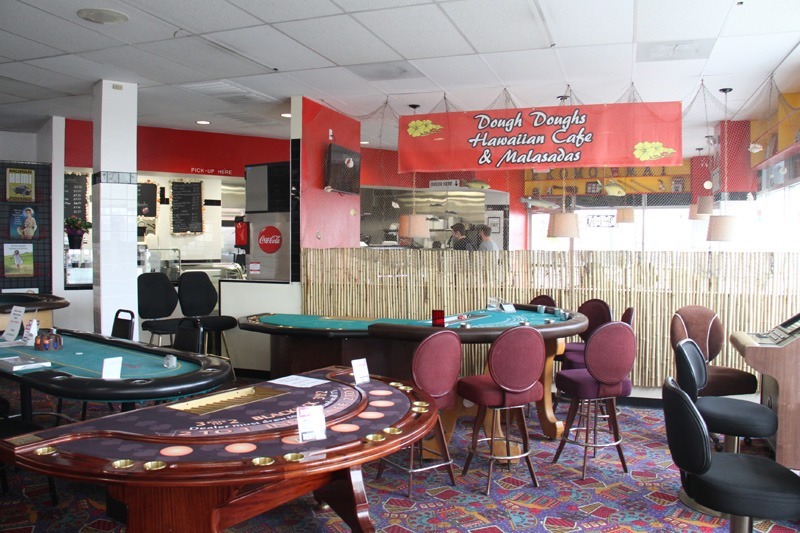 Dough Dough’s Hawaiian Cafe replaces the former sandwich shop, Gambler’s Cafe. 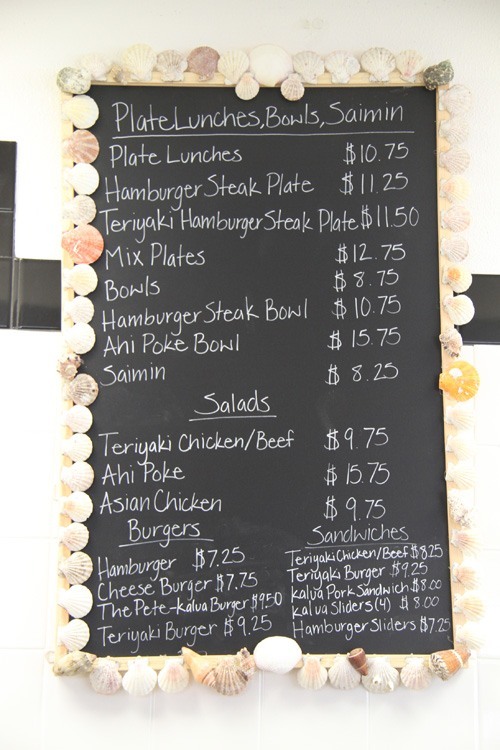 The cafe has a full menu, including an excellent “plate lunch” that will be familiar to those familiar with Hawaiian fare. This blog personally lived in Hawaii for a decade, and we can attest the plate lunch at this modest eatery is one of the best we’ve had in Las Vegas. 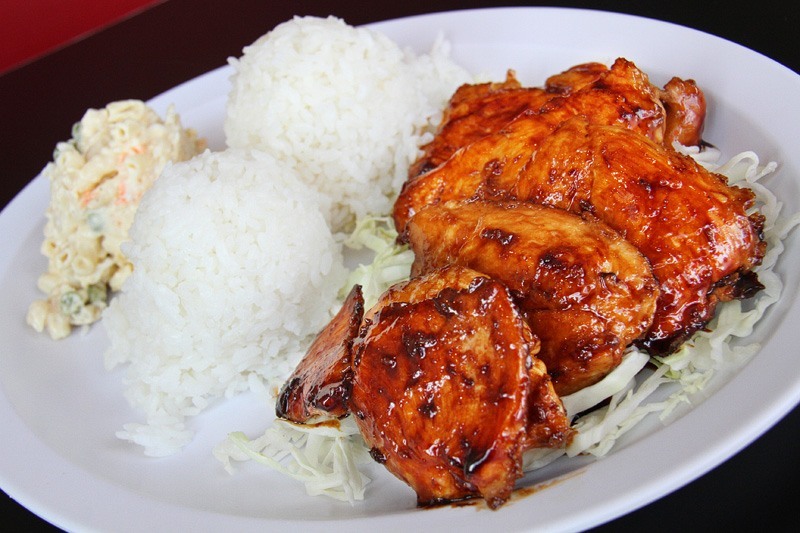 Teriyaki chicken, check. Two scoop (sic, it’s a Hawaii thing) rice, check. Macaroni salad, check. The menu also features salads, burgers and sandwiches. This is the Cliffs Notes version. Find the full menu on the Dough Dough’s Facebook page. 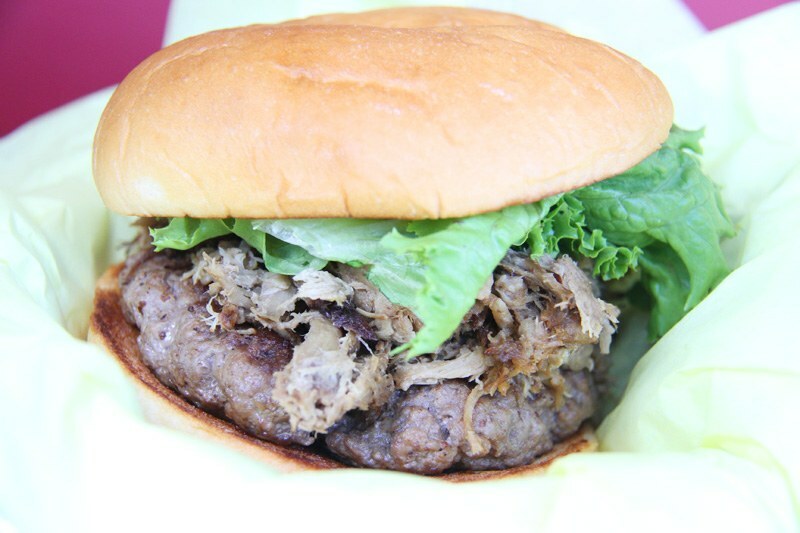 The Pete Kalua Burger is a hamburger with (wait for it) kalua pork on top. “Kalua” means “to cook in an underground oven.” You’d know this if you were a cook in Hawaii, which, we’re pretty sure, is considered a Pacific Rim job. Undeniably, though, the malasadas are the star of the show at the Hawaiian Cafe. You know they take malasadas, basically fried dough smothered in sugar, seriously here because there’s an entire menu devoted to this Hawaiian treat. The malasadas come three ways, as we all wish we did, as either Big, Mini or Bites. They’re all amazing, satisfying and utterly addictive. The large malasas come with an extensive selection of fillings, including cherry, raspberry, strawberry, apple, guava, pineapple, vanilla, chocolate, coconut cream, lemon, blueberry, cream cheese, apricot and mango. If you insist upon a filling, just save yourself some time and do the lemon. These malasadas will change your life for the better. Or, at the very least, for the wider. 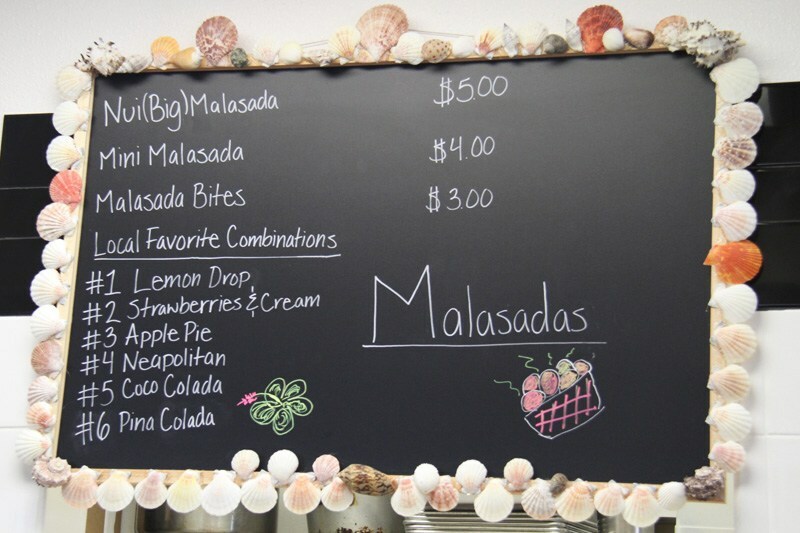 The malasadas also come in “Local Favorite Combinations” like “Lemon Drop,” “Strawberries and Cream,” “Apple Pie,” “Pina Colada” and others. 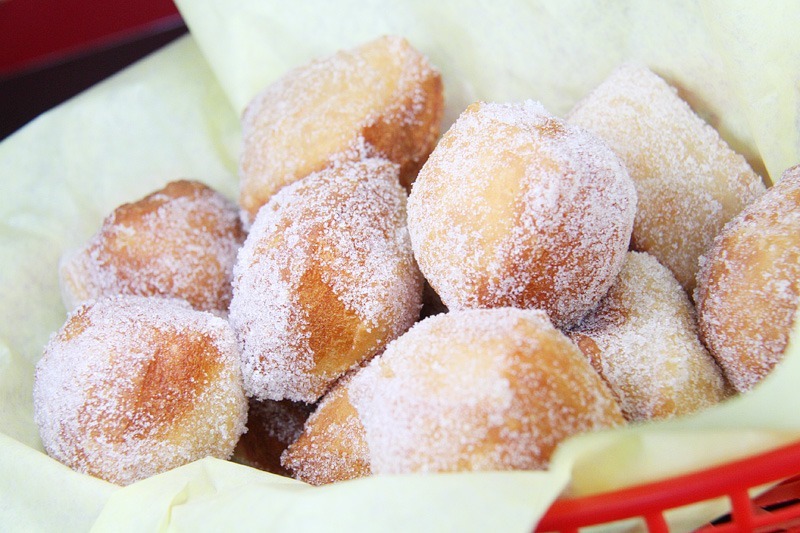 We are a malasada purist (shocker), so we prefer Mini Malasadas (six medium-sized malasadas) or Malasada Bites (a dozen donut hole-sized malasadas). “Malasada” means “under-cooked” in Portugese. 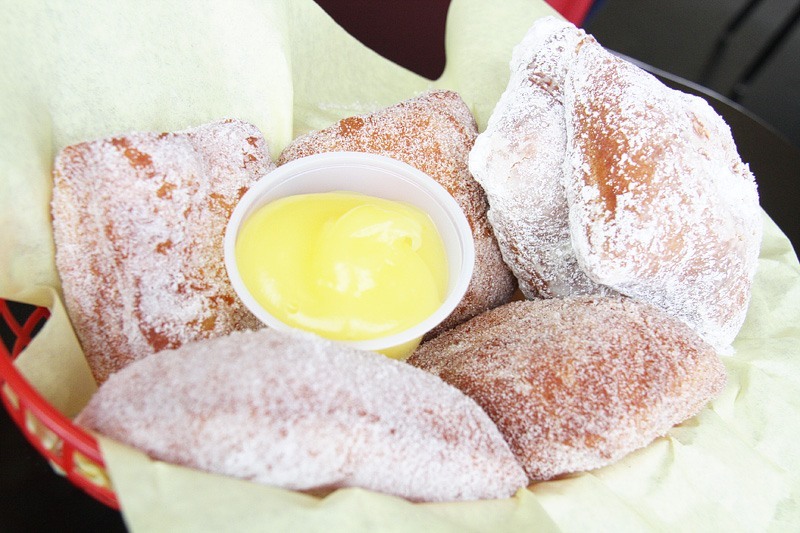 The malasadas at Dough Dough’s, however, are fried to perfection. The minis and bites are rolled in a choice of sugar, including plain, pure cane, powdered or cinnamon. When it comes to the malasadas at Dough Dough’s, your expandable waistband may just have met its match. No reservation needed, at least until word gets out. Consider it out. Despite the restaurant’s challenging location, these sugar-coated delights are an absolute Las Vegas must-try. While you’re there, wander through the Gambler’s General Store. It’s a great place to get gambling-related merchandise and possibly to put a $2,800 craps table on layaway because you seriously need to get this blog a Christmas present. Dough Dough’s Hawaiian Cafe & Malasadas is located at 800 Main Street, and has limited hours at the moment, from 8:00 a.m. to 2:00 p.m. This entry was posted in Downtown Las Vegas, Las Vegas, Las Vegas Restaurants on October 25, 2017 by Scott Roeben. 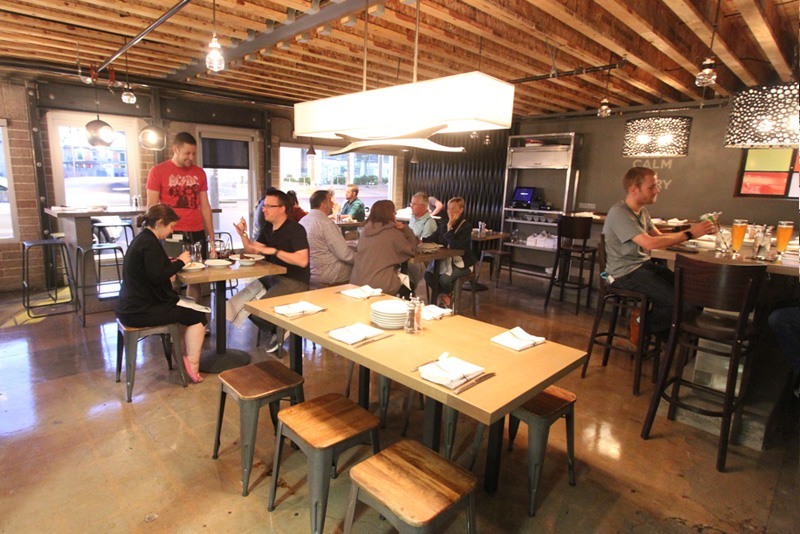 A popular downtown eatery, Carson Kitchen, has re-opened following an expansion. 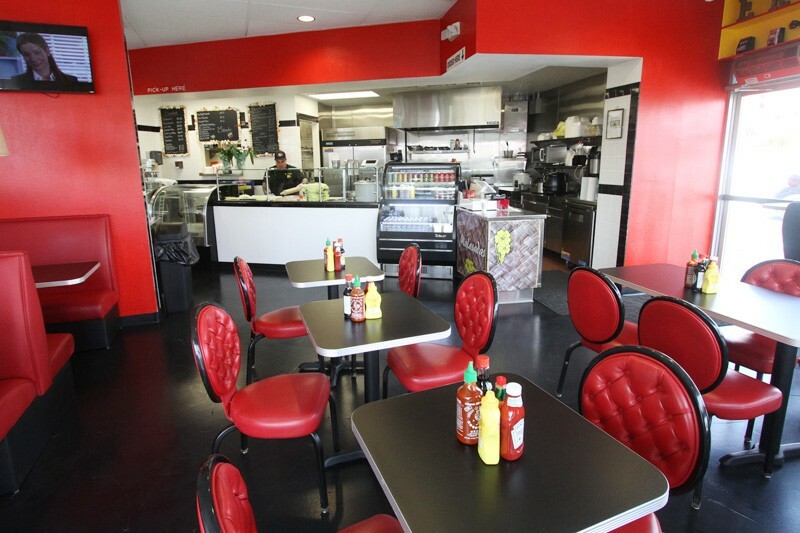 Carson Kitchen is located at 6th St. and Carson Ave. Which doesn’t help you find it, but we figured we’d throw it out there, anyway. In June 2017, Carson Kitchen celebrated its three-year anniversary, and has now added about 550-square-feet to its modest footprint. The expansion took over a space previously occupied by Black Spade Tattoo. Additions included a new entryway and bar, especially that last thing. Carson Kitchen seats six, or 12 if you’re cool with PDAs. 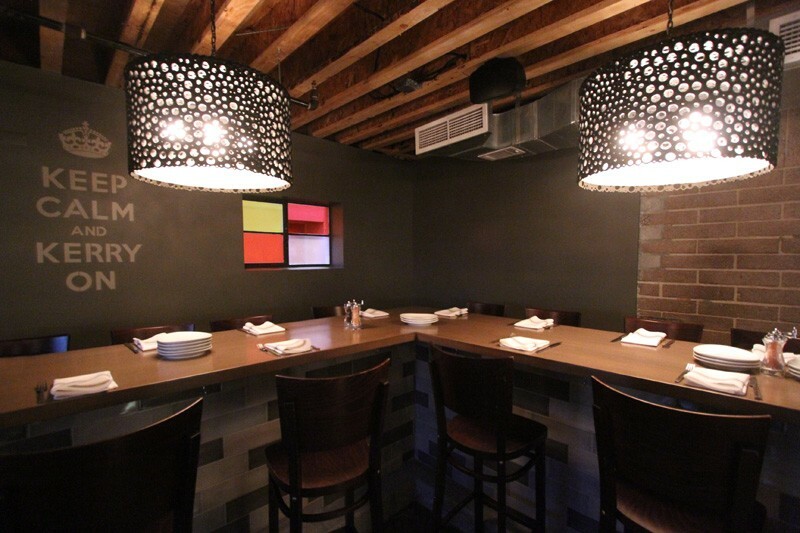 The Carson Kitchen expansion increases the seating capacity of the restaurant by about 24 seats. Twenty-four more seats may not sound like a lot, but when you’re hangry, it makes all the difference in the world. The restaurant has kept its open kitchen and social seating, and the menu remains the same, replete with palate-pleasing fare. 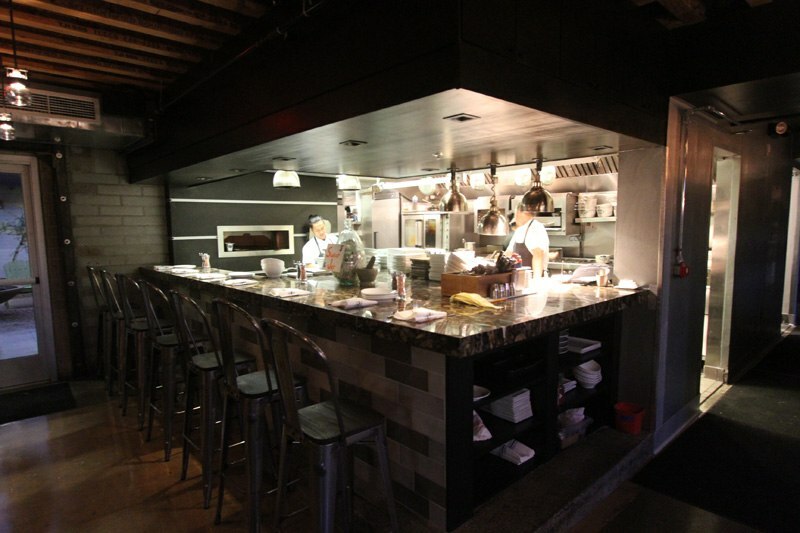 Carson Kitchen’s open kitchen lives up to its name. Because it’s open again. This isn’t rocket science. 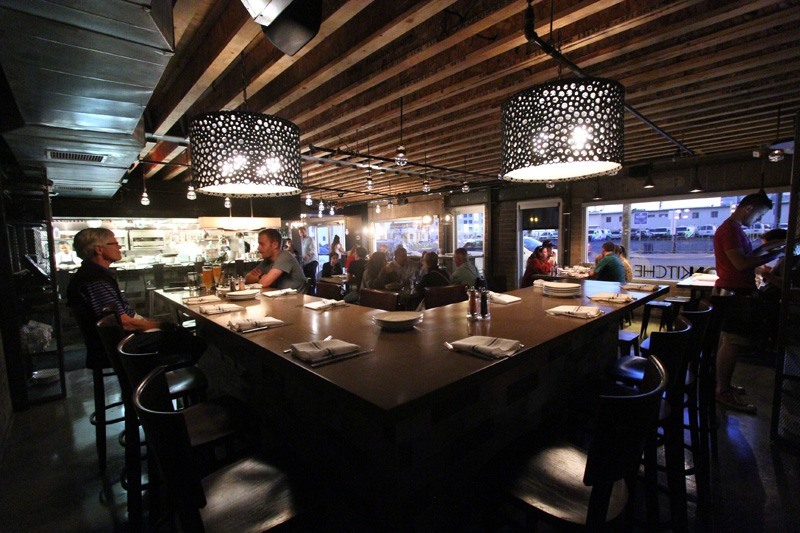 The food at Carson Kitchen is exceptional, and we’d love to say we dine there often, but the establishment doesn’t serve Captain Morgan, so that’s a nonstarter for us. 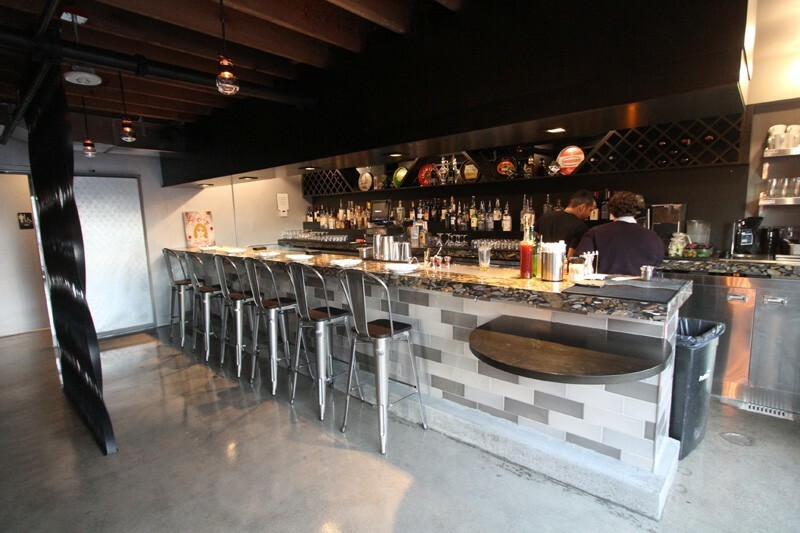 Still, Carson Kitchen continues to receive raves, so it’s well worth a try. Social dining takes some getting used to, much like this blog talking about itself in the first person plural. 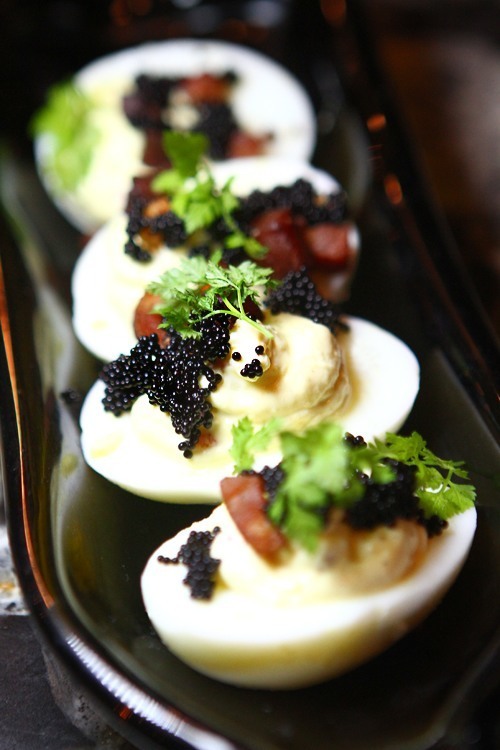 The “Devil’s Eggs” are a must-try. Go here for the full Carson Kitchen menu, and see more of our photos of the food. Carson Kitchen is open Sunday through Wednesday 11:30 a.m. to 10:00 p.m. and Thursday through Saturday 11:30 a.m. to 11:00 p.m. Yes, we copied and pasted that from a news release. Don’t judge. This entry was posted in Downtown Las Vegas, Las Vegas, Las Vegas Bars, Las Vegas Restaurants on October 24, 2017 by Scott Roeben. As if to prove things are beginning to normalize in Las Vegas, it’s another drivel-fueled episode of the Vital Vegas Podcast! On this week’s show, we have lots of surprises in store, the majority of which we can’t entirely recall because rum. A highlight of the show is a completely random conversation with Coolio. Yes, that Coolion. 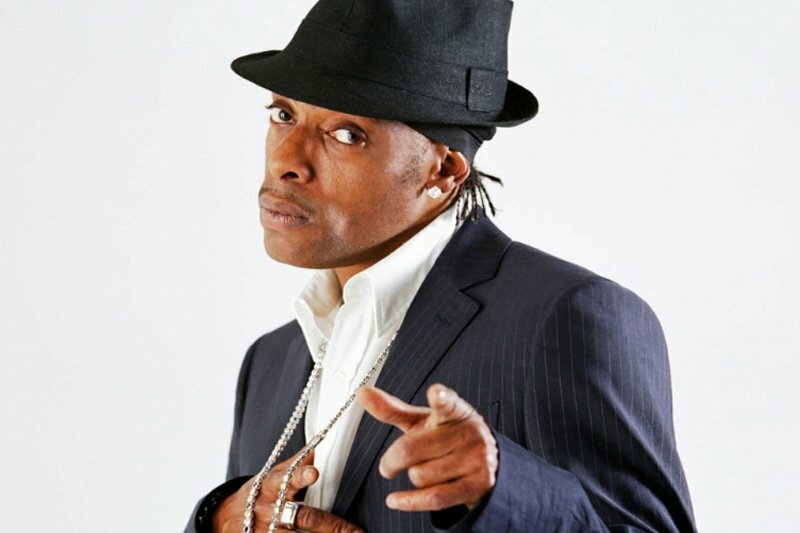 Our chat with Coolio is proof just because a podcast has “Vegas” in the title doesn’t mean it’s about Vegas. 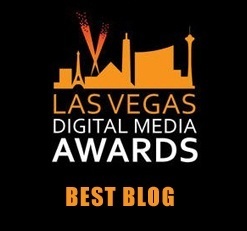 We also drop some major skinny about a variety of Las Vegas topics including the cardless slot system being rolled out by Station Casinos, Gold Diggers closing at Golden Nugget and far too much sports-related scoop involving the Las Vegas Golden Knights, the 51s, the Las Vegas Lights, the Raiders and the WNBA’s San Antonio Stars. Loyalty cards, schmoyalty schmards. Go cardless. As is our way, we round up a metric hell-ton of Las Vegas news, and plow through the listicle of the week: “10 Reasons the North End of the Las Vegas Strip is About to Explode.” That’s right, we’re suddenly bullish on projects like Resorts World, All Net Resort Arena, Wynn Paradise Park and a slew of others. Join us as our Las Vegas pendulum swings its way toward maximum optimism! Wrangle a squat, push “play” and luxuriate in a bubbling hot tub teeming with so much Las Vegas you’ll need a salve. Or something. 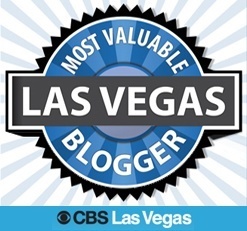 This entry was posted in Las Vegas, Vital Vegas Podcast on October 23, 2017 by Scott Roeben.